Almost every PPC advertiser, by now, is aware of the new ad format launched by Google, namely the Expanded Ads. 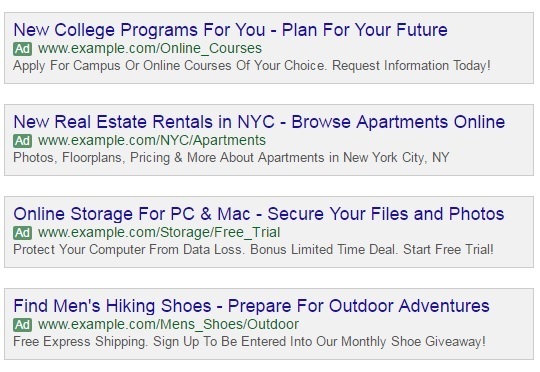 In a brilliant move, Google has modified the entire format of text ads, giving them a whole new look. Now, advertisers have more than enough space to convey their messages to prospective customers. 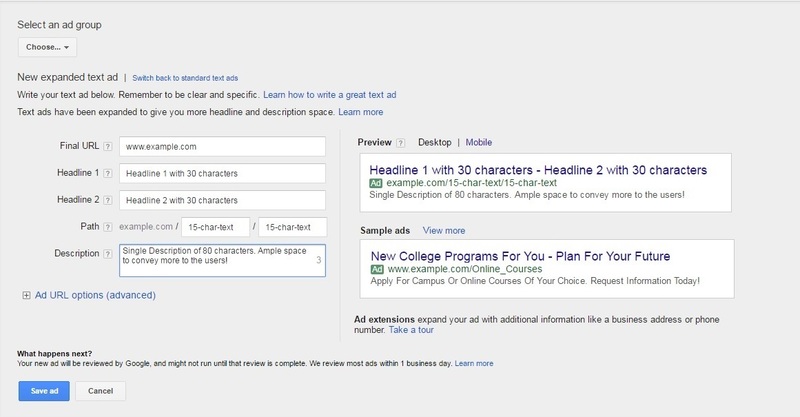 Customers can now be better motivated to click on websites’ ads and potentially convert. If you haven’t heard about them until now or have no idea how they look like, which I’m sure, would be none of you, but still, for those who have been living under a rock, here’s what they look like. These are sample ads from Google. Expanded ads have 2 headline fields (instead of the ole’ one field!) and a single description field. 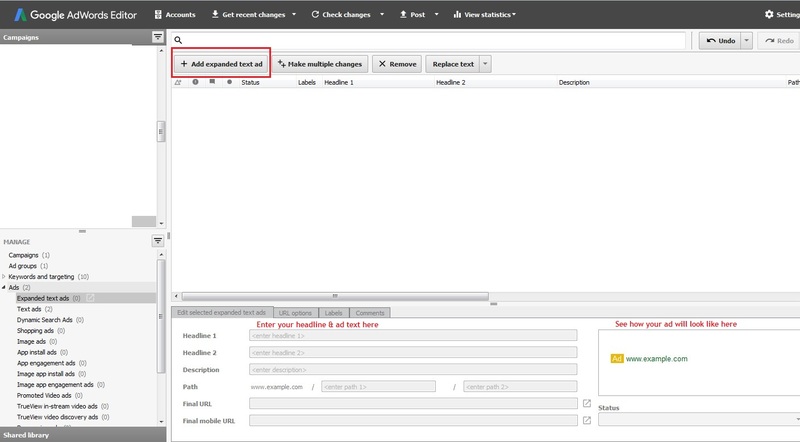 The headline fields are of 30 characters each and the description field has a character limit of 80 characters. That’s a lot of character space! The display URL field has also been given a nice makeover. Where we used to have one continuous field, we now have it broken up into two ‘Path’ fields. These are a part of the display URL and are of 15 characters each. The website name in the display URL will be picked up from the destination URL itself. 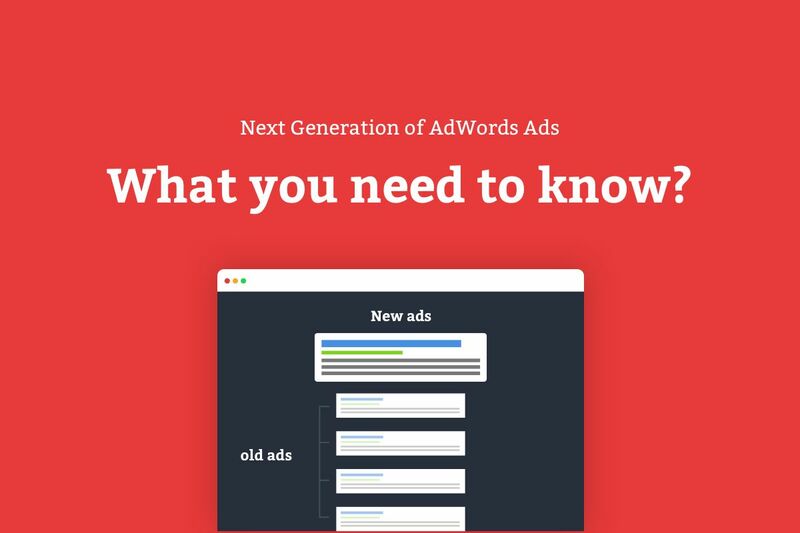 Expanded Ads can be created in the AdWords Interface online (when you sign in to your adwords account on a browser) and in the AdWords editor as well. When you’re here, click on ‘Add expanded text ad’ and then create your new ad! Below are previews of how the ad will show on desktops and mobile devices. Note that how your ad will be seen depends on the amount of text in the ads. More on that later! Well, until now we were focused on the creation and the format of the ad. Now when that is covered, let’s talk about the software of these ads, i.e. the content of the ads! Headlines – With the expanded ad format, the headlines are now the most important part of the ad. Your description is important as well, but it’s the headlines that will draw a lot of attention. So make sure that you convey all crucial messages in the headlines. But you have to be intelligent and cautious in doing so.Depending on the length of your headlines (aka the text in them) and the device/ screen size of the user, Google may show your headlines in either one line, divide them into two lines or truncate your second headline. Considering that Google may or may not show your second headline completely, especially if your user is viewing the ad on a smartphone with a smaller screen size, you’ll have to formulate headlines that are descriptive yet precise. This is why ensure that your call to actions remain in the description instead of the headlines. Having said that, we still would recommend that you convey all the necessary information within the headlines themselves, as they still remain the undisputed eyeball grabbers! Hyphenated Headlines – Another thing to keep in mind is that there will always be a hyphen between headline 1 and headline 2 when your ad is shown. So avoid using hyphens anywhere else in the headlines and try to keep them as contextually connected as possible. Path Fields – The Path Fields of the display URL are a gold mine waiting to be tapped. You can literally write anything you want, within the AdWords guidelines, of course! So try and include your best keywords or your top performing ones in these fields. However, be extremely careful that your keyword usage in the ad and the URL combined is not over the top, or something that Google might disapprove. While the old standard ad format will still work, advertisers will not be able to create standard ads after January 31, 2017. Hence, create all new ads in the expanded format going forward and rework the previous ones, simultaneously. A quick tip to rework the old Ads: While updating/ editing your ads to the expanded format, instead of simply including a second headline to conform to the new format, create new ads entirely. Editing your old ads will mean that you’re just giving the user the same old information, only wrapped in a new package. Thus, we strongly recommend that you use this opportunity to create brand new ads. You might just see better results with that! A parting note: The message delivered in your expanded ads must be relevant for all devices. Since expanded ads have no device preference, the same ad, with the same ad text is what users will see across desktops, mobile phones, and tablets. Hence, it is essential that the message you convey in your ad should not be such that it makes sense only on mobiles and not on desktops or vice versa. For example, say your call to action is ‘Call Now’, then your phone numbers should be visible on the desktop displays as well, so that this call to action does not become redundant on desktops. That’s all Folks! 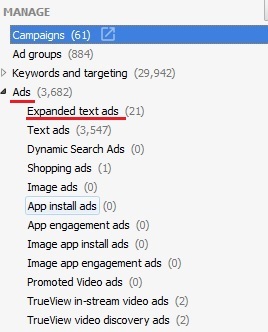 Is there anything you would like to add about expanded ads? What has your experience been with them? Do share with us in the comments below and let’s get talking!